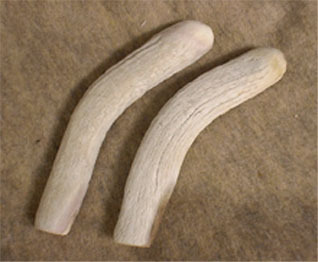 <H3>WARNING: WE CANNOT EXPORT WILDLIFE PRODUCTS OUTSIDE THE US</H3><p>Finished and ready-to-use billet of brown, white to gray-white deer antler. These billets will either be base sections from mule or whitetail deer, or they may be beam sections of solid axis deer antler. Any will do for medium percussion work on heated or highly knappable stone, dacite or obsidian. 6 to 9 ounce size for medium and fine work on all size points. NOTICE: Antler prices have been on the rise nationwide due to the "doggie chews" market. We expect further increases this year.